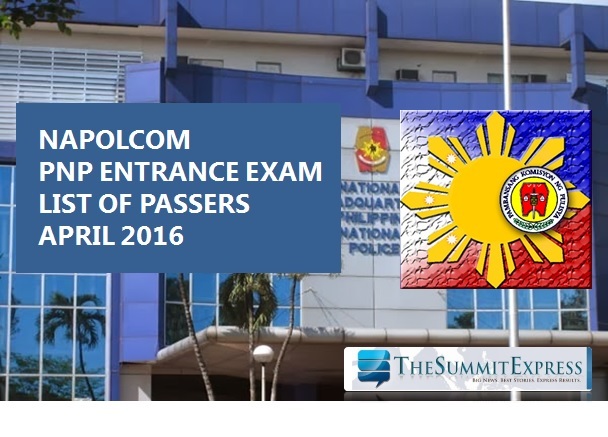 MANILA, Philippines - The National Police Commission (NAPOLCOM) officially released on Friday, June 24 the full list of passers for April 2016 Philippine National Police (PNP) entrance examinations. A total of 2,705 out of 23,175 (11.67%) examinees successfully passed the examination which was conducted in several test locations nationwide. The three-hour PNP entrance examination covered questions on general information, verbal reasoning, quantitative reasoning and logical reasoning. The individual reports of rating will be mailed to all examinees. Verification of test results can be done at the NAPOLCOM central office and its regional offices nationwide. NAPOLCOM conducts two sets of police exam every year. The PNP Entrance exam is open to all Filipino citizens who possess the age, height and educational requirements as provided in the PNP Examination announcement and for Police Officers I (PO1) whose appointments are temporary for lack of appropriate eligibility.